"This handbook provides comprehensive information relevant to community and district nurses and new community matrons. It incorpoprates discussions on legal and ethical issues, case management, interprofessional working, commissioning and leadership. This book is an excellent resource for nurses who want to broaden knowledge of their role and who may be undertaking community matron university modules. "Nursing Standard"I believe that A Handbook for Advanced Primary Care Nurses should be extensively read and that it will prove to be an essential resource for nurses striving to improve public health and patient care in the communities of today and tomorrow. It may, with political will and a skilled and determined workforce help Florence Nightingale's vision come true. "Lynn Young, Primary Health Care Adviser, Royal College of Nursing, UKThis important new handbook for Primary Care Nurses is designed to assist senior nurses in developing the understanding and skills required to be effective at both strategic and operational levels. 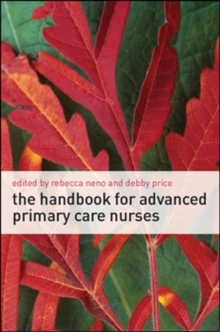 As well as exploring the context of advanced primary care practice, the book provides the tools needed for enhancing care delivery within both primary care and community settings.A Handbook for Advanced Primary Care Nurses is an accessible guide to working strategically in primary care. It offers practical support across a range of core areas, including: Case finding and case management Mentorship Leadership and management Needs assessment Interprofessional working PrescribingNeno and Price encourage readers to think analytically about their practice and include activities and reflection points throughout the book to help with this. This book is the ideal companion both for nurse practitioners undertaking courses at advanced practice level and for professionals working at all levels in primary care.